Feel fancy with this date night halibut recipe baked in parchment and slathered in a fresh pistachio mint pesto. It's 20 minutes of meal prep for a 5-star quality supper! Pulse the parsley, mint, olive oil, pistachios, garlic, and salt until smooth in the bowl of your food processor. Scrape down the sides and pulse once or twice more to be sure no large chunks remain (I added a little more olive oil). Spoon into a bowl and mix with the cheese if using. Cover and set aside. Heat the oven to 450 degrees F. Arrange 4 12" sheets of parchment paper on a clean work surface. Arrange the squash, carrots, and peppers in the center of each sheet. Top with some scallions. Add 1 tbs of wine/broth to each mound of veggies. Nestle the halibut in the center of each and season with salt and pepper. 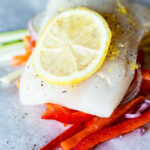 Divide the lemon zest and butter evenly between the halibut portions and lastly, top with a few slices of lemon. Arrange another single sheet over each of the portions. Fold up the edges, crimping tightly, to create a nice sealed little packet, about 7 or 8 inches long. Place on a baking sheet and cook for 15 minutes, until the fish is cooked through and fakes easily with a fork. Serve the fish on plates in the packet. Allow a moment before unwrapping, as the steam can be really hot! After opening the packets, spoon the mint pesto over top of each filet if desired. This is one of those meals that flys together if you do the prep work ahead of time. Once the chopping is done - this halibut baked in parchment with pistachio mint pesto comes together quick and is the perfect date night diner! To adapt this halibut recipe for #Whole30, omit the cheese in the pesto and use ghee instead of butter for the fish. Be sure to use approved chicken broth in place of the wine. This was great paired up with roasted Brussels sprouts or a fresh spinach salad.